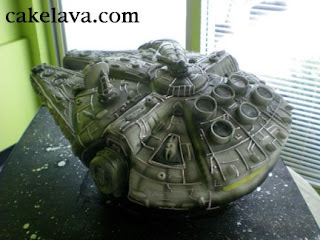 It's been over a year since Karla placed the order for her fiance Jason's sculpted STAR WARS Millenium Falcon Groom's cake. We're STAR WARS fans and have been looking forward to this cake for the past year, and were excited to deliver it to Karla and Jason's wedding over the weekend. 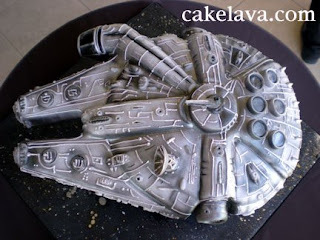 Rick made Jason's Millenium Falcon (MF) cake out of fondant and carefully studied all angles of the falcon to make sure no detail was overlooked. He propped up the MF on a platform of cake below to give the illusion that it was in flight. Jason chose our ever popular Hot Fudge Sundae flavor -- chocolate cake with fresh whipped vanilla cream, chocolate fudge and raspberry preserves. 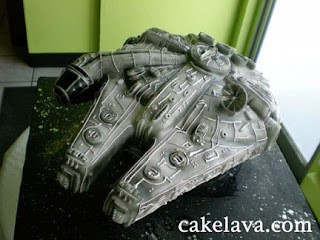 Our client's Lynn and Curt have also ordered a sculpted Millenium Falcon Groom's cake for their wedding next year. Coincidentally, also in the Hot Fudge Sundae flavor. We'll be looking forward to making it again! Check back here in the next couple weeks to see Visionari's photos of the rest of Karla and Jason's gorgeous oceanfront wedding including their monogram wedding cupcake tiers. 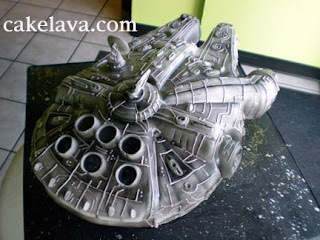 See our Millenium Falcon cake along with other new celebration cakes on cakelava.com. Awesome cake!!!! How long did it take Rick to make it? Rick worked on a bunch of cakes on the same weekend and doesn't recall exactly how long it took to make the MF. Glad you liked it! My fiance really wants this cake, how much would it cost to have one made?